Powered by Accenture and offered by YES. 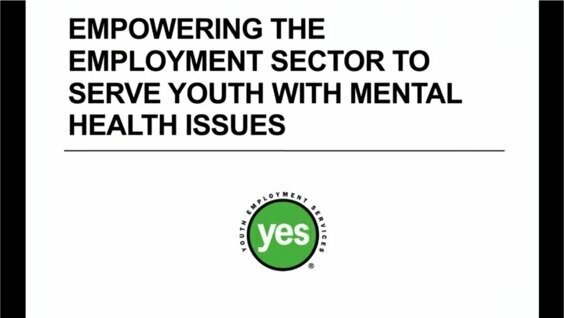 A new workshop curriculum package to help Employment Specialists better support youth living with mental health issues seek and maintain employment!! YES has created the YES Mentorship Program, to support youth seek job/career advice, expand their networks, and develop meaningful mentoring relationships with industry professionals across the GTA. YES has partnered with Magnet network to help job seekers find employment. Q: What will I need to find a job? ►Help if you want it, from YES. To register to speak to someone at YES click here. Q: How long will my job-search take? A: Sometimes only a few days but it might take weeks or even months – so stick with it. Have a positive attitude: You will get that job! Rejection is normal; it happens to everyone. The important thing is to get going right away. Q: How much time should I spend looking for work? A: You’ll often hear people say “it’s a full time job getting a job” because it can take a lot of time. The more time you spend on your job search, the better your chances of finding a job sooner. Q: When do I get a chance to talk to someone? A: People looking for a first job commonly have to submit 20 résumés for every interview they get. Actually getting a job may take several interviews. So don’t be discouraged. Q: So are most of my résumés wasted? A: No. Employers can keep them “on file” for future job openings and get back to you weeks, even months later. So keep a list of all the places you’ve applied, where they are located and who you talked to there. Q: How can I keep from getting discouraged? A: Think: I will get a job. Stay at it and try your best. It will happen. Everyone was once in the same position as you are now. They made it and you will too. Q: What if I can’t wait to find a job? A: If you need a full-time job today because you are desperate for money to pay rent or buy food, contact YES Toronto or your local youth employment centre. We can help. Call today. Q: What if I don’t have an address or phone number right now? A: You still have options. YES Toronto can often get you a free voice mail box and phone number to use while you are looking for work. We can also help you get connected to housing services and social assistance. Q: How much will a job search cost me? A: Job searching costs some money. YES Toronto and other employment centres can help with free services – including Internet access, faxing and newspapers. YES Toronto often arranges free transportation too – and even clothes for interviews. Q: Where’s the best place to look for jobs? A: Networking is simply telling everyone you know that you are looking for a job, and asking them to tell people they know. It’s important since most young people get their first few jobs through connections — relatives, teachers, coaches, friends and parents of friends. Q: How do I network? A: Take a few hours to call everyone you can think of. The more people you tell, the better your chances will be. Tell them the kind of job you are looking for and the special skills you have to offer. Q: How do I ask about networking? Q: What if networking isn’t done in my culture? A: In Canada people use networking to find all kinds of things apart from jobs: an apartment, a used car, a restaurant — even a dentist. If networking is frowned upon in your culture, you should explain this to family and friends who are newer to Canada and don’t understand why you are asking them to help you look for a job. Résumés and cover letters are an essential part of your job search. Here you can find out how to write effective résumés and cover letters, including samples. A résumé is simply a summary of who you are, what you have done, and what you can do. You can get help with your résumé at YES Toronto or your local youth employment centre, usually for free. Is there more than one kind of résumé? What information goes on my résumé? Your full name, address phone number and — if you happen to have them – fax number and e-mail address. Your resume should describe your skills, abilities, work history, volunteer experience, education level, interests and strengths. What are some common do’s and don’ts of résumé writing? ► Do list other languages you speak if you are going to be dealing with the public. Candidates with more than one language are an asset to companies and organizations because they can provide better customer service. ► Do list all the computer programs you know. ► Do have someone you trust proofread your résumé for spelling mistakes and grammar. ► Do use professional wording; for example, “child care” sounds better than “baby-sitting”. ► Do send a clean, neat, and tidy résumé. ► Don’t list your date of birth or your social insurance number or references. ► Don’t attach a photograph of yourself unless it is specifically required. ► Don’t print your résumé on coloured paper. Use only white, off-white, or light grey. ► Don’t send a résumé that has been photocopied so many times that it is blurry or crooked on the page. Print a fresh copy that has been updated with your latest skills and experience. ► Don’t ever lie, mislead, or inflate your actual skills and experience. ► Don’t overdo fonts, boldface, underlining, or italics. ► Don’t squish your résumé onto one page if you have enough to fill a second page. A second page is fine as long as you don’t have too much white space left over at the bottom. Which kind of résumé is right for me? The functional kind is best choice for people who haven’t had many jobs. Combination résumés are for those who have had one or two jobs. More experienced workers would usually choose a chronological résumé. A cover letter is a short, professional-looking business letter, written with a personal touch, that accompanies your résumé. A strong cover letter may be what sets you apart from the competition. Even when the job has an application form, a cover letter along with your résumé may give you the edge over other candidates and get you an interview. What does a cover letter look like? What are some of the do’s and don’ts of cover letters? ► Do have an answering machine or voice mail hooked up to the phone number you provide in your letter. ► Do tell friends or family members to take detailed messages for you while you are job searching. ► Do use an e-mail address that is proper (avoid nicknames or slang) and be sure you check your e-mail often during your job search. ►Do have someone you trust (teacher, parent, friend, employment counsellor) proofread your cover letter. Poor grammar and spelling mistakes are unprofessional. Take the extra time to ensure they are avoided. Write a new cover letter for every job you apply for. ► Don’t say how much you want to be paid in your cover letter, unless an advertisement asks you to give a salary expectation. ► Don’t put your references in your cover letter. ► Don’t rush your letter. After you’ve written it, wait a day, then look at it again with a fresh perspective. ► Don’t forget to sign your letter in blue or black pen. ► Don’t oversell yourself. It’s important to be confident, but don’t overdo it. A: One good way of finding a job is by applying in person. For some industries, such as retail and restaurants, they often prefer that you apply in person. Take a stack of résumés along with you and be prepared to pick up an application form too. Q: How do I use classified ads? A: Check your local papers out to see which ones have ads for the kinds of jobs you’re looking for (and on which days the ads run). Be sure to check the papers as soon as they’re available. If it’s your own paper, use a pen to circle the ads you find interesting. Then go over each of the circled ads several times to make sure you have the right skills and qualifications for them. Q: What if I don’t buy newspapers? A: Most libraries and employment centres like YES Toronto have free newspapers you can look through. Q: What kind of jobs should I consider? A: Beware of jobs that sound too good to be true. Make sure you know what’s involved before you accept a job offer. You should never have to pay an employer for giving you a job or for products you’ll be selling. And don’t sign a sales contract until you have it reviewed by someone you trust – a parent, teacher or experienced friend. Q: Where else can I look? A: Companies often use internal postings and word of mouth to attract potential candidates. Through special arrangements with employers YES Toronto gets the information on many real jobs that are not advertised elsewhere. Contact us. A: A reference is someone who agrees to speak honestly about you in a positive way to a potential employer. A reference can be a previous employer, a teacher, a coach, or someone else familiar with your skills and abilities. Q: What is a reference letter? A: A reference letter is a professional letter written by a previous employer, teacher, coach, or someone else who can honestly speak about your skills and abilities. Most employers will want to speak directly to your reference; however, some might also accept a reference letter. Q: Will a copy of my reference letter do? A: Always make photocopies of a reference letter to give to employers. At an interview, have the original with you in case the employer asks to see it, but let them keep only a photocopy. Q: Who should be my references? A: The best references are employers, especially your last employer. So, whenever possible, leave a job on good terms — and always ask for a reference letter. Q: How can I get references if I’m looking for my first job? A: Employers understand that you won’t have previous employers as references. Someone who has supervised you in some way — a teacher, coach, clergy or someone you volunteered for — can also be a good reference, especially if they’ve known you for some time. Q: Who cannot be one of my references? A: A reference can’t be someone who is related to you. A buddy, a girlfriend or boyfriend is also not a good idea. Never use someone who shares your address and phone number. Q: What will I need to say about my references? A: You have to say what your relationship is to that person, and when that relationship occurred. Be honest. Q: What will a reference need to say about me? Q: Is being a reference a big deal? A: Yes. Choose someone you like and who likes you. Get their permission first. And let them know when you have an interview so they can expect a call. Q: When do I have to give my references? A: Be prepared with your references before you start your job search because some employers will expect you to list your references when you first apply. A: Try to imagine yourself sitting across from an employer (or two), with your head held high, answering their questions easily and with confidence. Imagine success. Practising your interview skills will help you when the real thing comes along. Ask someone you trust to interview you as a kind of rehearsal. Q: What should I do at the interview? A: A good first impression is important: smile, shake the interviewer’s hand firmly and make eye contact while saying “It’s nice to meet you”. Know what’s on your résumé. Make sure you know where the interview will be held and how long it will take you to get there. Q: What should I wear to an interview? A: Dress nicely — a bit nicer than you would on a typical work day. (If you don’t have the right clothes, try and borrow them for the interview.) Make sure you’re well groomed and that your clothes are clean, and pressed if they require it. Q: What should I bring with me to the interview? ► The exact address, including suite number, floor, office number, wing, or any other specific directions you were given. ► The name of the person who will be interviewing you. ►A list of references, typed neatly on a separate sheet, even if you’ve already given them to the employer. It shows you are organized and thinking ahead. ► Two extra clean copies of your résumé: One for you to look at during the interview and an extra one for the employer. ►Three questions you’ve prepared in case the employer asks you for any questions at the end of the interview. A: You should answer every question in full – more than a simple yes or no. Use examples from a previous job, school or other experience. It’s okay to be nervous. Try to find positive aspects to whatever it is you’re discussing. Be confident and enthusiastic. Sell yourself.